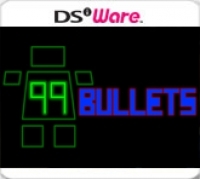 Description: This is the same as the DSi release of 99 Bullets, but available on a 3DS when the eShop went live on June 6th, 2011 in North America. Box Text: A fun space shooter with a retro look, where losing a bullet is losing a life, and losing a life is losing a bullet! 99Bullets, a fun space shooter game with a retro look, where to lose a bullet is to lose a life, and to lose a life is to lose a bullet. The galaxy IRATA 2601 is threatened by Black Eye and his minions, but V-99 is ready to stop him with his 99 bullets. This is a list of VGCollect users who have 99 Bullets in their Collection. This is a list of VGCollect users who have 99 Bullets in their Sell List. This is a list of VGCollect users who have 99 Bullets in their Wish List.